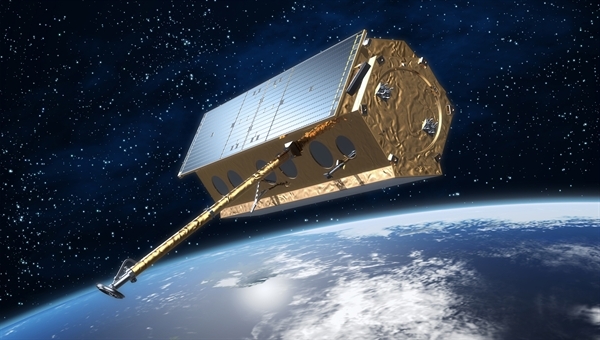 The German radar satellite TerraSAR-X will orbit the Earth in a polar orbit at a height of 514 kilometres; using the mission's newly designed active antenna, it will gather high-quality X-band radar data from the entire planet. TerraSAR-X will operate independent of weather conditions, cloud coverage or lighting and will supply radar data at a resolution of up to 1 metre. TerraSAR-X is a German Earth-observation satellite. Its primary payload is an X-band radar sensor with a range of different modes of operation, allowing it to record images with different swath widths, resolutions and polarisations. TerraSAR-X thus offers space-based observation capabilities that were previously unavailable. The objective of the mission is to provide value-added SAR (Synthetic Aperture Radar) data in the X-band, for research and development purposes as well as scientific and commercial applications. The successful launch of TerraSAR-X on 15 June 2007 at 08:14 local time from the Russian Baikonur Cosmodrome in Kazakhstan marked the start of a campaign to map the Earth at an unprecedented level of accuracy. The aim is to create new, high-quality radar images of the Earth’s surface over the next five years. The satellite is in a near-polar orbit around the Earth, at an altitude of 514 kilometres. Using its active radar antenna, it is able to produce image data with a resolution of down to one metre, regardless of weather conditions, cloud cover or absence of daylight. TerraSAR-X has been fully operational since 7 January 2008. Every part of this satellite was built in a very compact way. It has a five-metre-long body with a hexagonal cross section and its primary payload is an active radar system. The radar beam can be electronically tilted within a range of 20 to 60 degrees perpendicular to the flight direction, without having to move the satellite itself. This has an obvious advantage: it allows the radar to zoom in on many more ground targets from the satellite’s orbit than would be possible using a 'non-steerable' radar. TerraSAR-X is being implemented on behalf of DLR German Aerospace Center with funds from the German Federal Ministry of Economic Affairs and Energy (Bundesministerium für Wirtschaft und Energie). It is the first German satellite manufactured under a so-called Public-Private Partnership (PPP) between DLR and Airbus Defence and Space. DLR is responsible for using TerraSAR-X data for scientific purposes; it is also responsible for planning and implementing the mission as well as controlling the satellite (Registered users can search online through all the available data in DLR's EOWEB catalogue (see the link in the right-hand column). If they submit their project proposals to DLR, scientists can receive TerraSAR-X data). Airbus Defence and Space built the satellite, shared the costs of developing it and is sharing the costs of operating it.The programme line "Geo-Intelligence", part of the "Communication, Intelligence & security" business line of Airbus Defence & Space, is responsible for marketing the data commercially. TerraSAR-X builds on the technology and insight gained in earlier radar missions, and allows systematic observations to be conducted over a longer period of time. Observing vegetation, for instance, is exceptionally relevant for human life. Accurate and up-to-date information about the distribution and composition of, and changes in, types of vegetation forms the basis for many applications. One of the things that makes TerraSAR-X stand out is its high spatial resolution, surpassing what was previously possible using civilian radar systems. This enables scientists to examine detailed ground features, for instance the differentiation between different crops, in order to arrive at an improved classification of ground use. The DLR Microwaves and Radar Institute (DLR-Institut für Hochfrequenztechnik und Radarsysteme), the DLR Remote Sensing Technology Institute (DLR-Institut für Methodik der Fernerkundung) and the German Remote Sensing Data Center (Deutsches Fernerkundungsdatenzentrum; DFD) of DLR cooperate closely in the 'SAR Center of Excellence'. The partner institutions complement each other by covering all relevant fields, from sensor technology and mission design to high-precision operational processing and value-added end-user products. Together with DLR's German Space Operations Center (Deutsches Raumfahrt-Kontrollzentrum), these institutes are also responsible for building the TerraSAR-X ground segment as well as operating the satellite over a period of five years.